A couple of weeks ago, Jes had been begging me to put curlers in her hair. Nights are always busy around here, and I kept saying, "Maybe tomorrow." 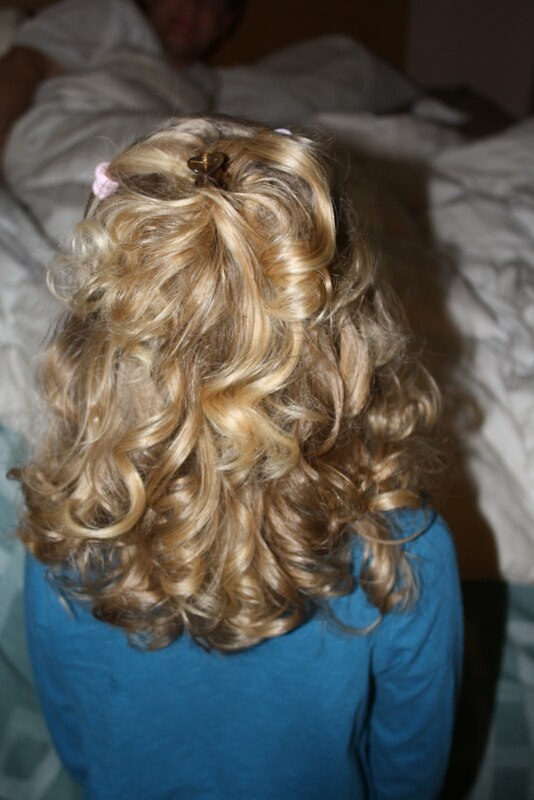 Finally one night I promised that the next night she could have curlers, so her hair would be curly for dress down day at school. The following night I ended up taking Parker on a Mommy date to the last Utah Jazz game. We had won the tickets in a drawing, and they were awesome seats that included dinner before the game started. We had soooo much fun! While at the game, I got a call from Jeremy. He sounds tired. "I finally got the kids all in bed, and as I'm tucking Jesi in, she tells me you promised she could have curlers tonight." I told him to apologize for me and to tell her I could just use the curling iron in the morning. He told her, and apparently she was not satisfied with the answer. Jeremy comes back on the phone. I hear a tired sigh, then, "Where do you keep the curlers?" 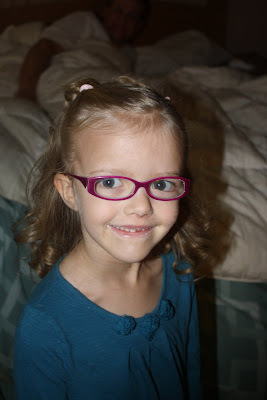 Jesi was so happy the next morning as she told me how Daddy had put curlers in her hair. I had wondered if he could even figure out how to put curlers in, but he obviously did a fine job. I think she's a pretty lucky girl, don't you? Dad to dad - way to go bro - way to go! Jesi - you are a beautiful as ever! WOW! I think he does a better job than most women could do. Wow he did a great job! Jesi you look beautiful! What a beautiful princess Jesi is with all her curls. And, Jeremy, you are a king in my book!